Faced with an IT issue? Call our support team for an instant fix. No fix, no fee basis on call outs and remote services. For instant IT Support, call our hotline on 01403 290 321 or 01293 912 321 on a no fix, no fee basis. Our IT support services can benefit your business with rapid response, expert fixes and no obligation quotes. We’re able to quickly diagnose IT issues and offer quality repair services at minimal disruption. All services are charged at a standard hourly rate with no hidden charges. Our team will quote your time for a fix and you’re under no obligation to accept the repair, meaning you can take time to think it over and have complete peace of mind. Depending on your system and the support required, it is possible for our team to diagnose your issue over the phone and then access your IT system to fix it remotely. A remote connection means that we can access your PC or server from our offices, without an onsite visit. Ideal for common problems such as back up failures, a remote connection (VPN) is a significant advantage to your business and network as your staff aren’t disrupted. We will get straight to solving the issue and get your services running smoothly again as quickly as possible. For all other network problems we offer rapid response onsite visits. 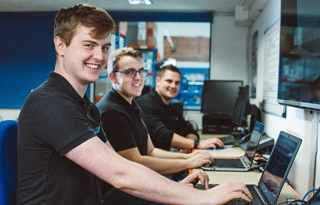 Whatever your requirements, you can be assured of a fast, friendly response from a professional team of fully trained IT technicians. We currently provide IT support in Horsham, West Sussex but also look after many clients in surrounding areas including Crawley, Haywards Heath, Guildford, Worthing, Dorking, Gatwick, Pulborough, Henfield and East Grinstead. If you are outside these areas please talk to us about IT support and services in your town. Please get in touch for more information on how we can provide you with expert IT support for your business systems.